Given any other option, no one watches football on their phone. NFL Mobile basically needed a reason to be. 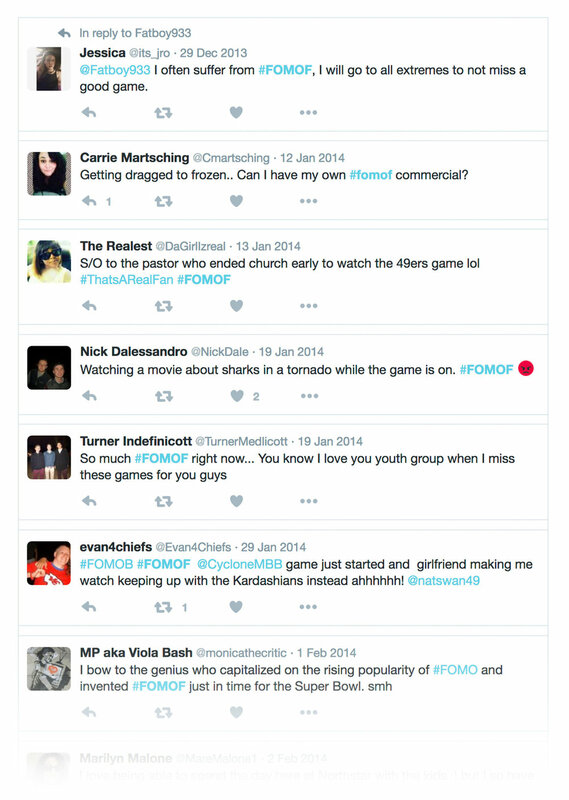 So this season, we took the existing social media phenomenon (FOMO and added the tension of not seeing the game. And thus FOMOF was born (Fear of Missing Out on Football). Given any other option, no one watches football on their phone. NFL Mobile basically needed a reason to be. So this season, we took the existing social media phenomenon (FOMO and added the tension of not seeing the game. And thus FOMOF was born (Fear of Missing Out on Football). TV introduced the term and, at the same time, we started responding to anyone tweeting about missing the game with FOMOF videos. Across Twitter, Facebook, and Instagram people proved that FOMOF was real as they made #FOMOF their own. We created a robust Twitter retargeting program to respond to fans who are missing the game with dozens of situational videos starring Brees. The hashtag #FOMOF featured in the campaign has been used organically by fans thousands of times across social channels like Twitter' and Instagram. Even now in 2017 you can still find people using it.